July 12, 2017 7:00 A.M.
Also present were Rich Simon – Director of Public Works, Dustin Bedore – Director of Electric Utilities, Joni Showalter – Police Chief, Sami Philbrick – Museum Director, LeAnn Taylor – Municipal Court Clerk/Judge, Brian James – Fire Chief, Mary Volk – City Clerk, and Andrew Finzen – City Manager. Andrew provided information for consideration of hiring an employee for cemetery in the event the Commission wants the operation under City operations. Andrew stated, if City performs cemetery work, the City will also need to acquire equipment to operate. This can be funded by using $100,000 from Cemetery Improvement Fund, which would not impact mill levy. The addition of an employee and benefits would be a net increase of $11,381 on mill levy. I have considered cancelling contract at year end and not hiring an employee until March or April, but do not know what the right thing is to do. Mayor Linin asked, are there legal issues if cancel early? Andrew stated, I spoke with City Attorney and we would be within our rights to do so if we take stance we are not satisfied with work being done. If we go that route, we can take two payments off contract. Vice-Mayor Fairbanks stated, I like the cemetery being under City if we can make budget work. Andrew stated, an option is to increase the Cemetery Fund by $11,381 to cover an employee. The Commission continued discussion for project development funds. Gwen stated, we have projects we want to complete every year but we do not put money in the budget for the projects. Andrew stated, a place to get funds is reduce the transfer from General Fund to Economic Development $30,000, increase Cemetery Fund for employee and budget remaining amount from transfer for project development. Mary stated, if the project development funds are not used at year end and there is budget authority, we could transfer project development balance to capital improvement fund. Commissioner Garcia stated, I will not vote for a tax increase, that is the good thing about a democracy. 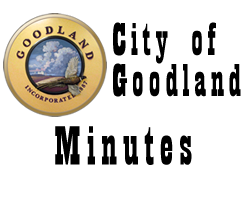 Commissioner Farris stated, I do not want to raise taxes one bit, it is already too expensive to live in Goodland. Mayor Linin stated, I appreciate Chief Showalter’s presentation and how efficient our Police Department operates. Citizen’s concerns are that moving to Armory, we are going to start increasing department. I am reluctant to increase the size of department right after that statement was made, even though I appreciate your presentation and what the department is doing. Citizens do not want to increase size of department right after you move out there. Joni stated, I know what you are saying but I cannot do anything about our numbers increasing. Our goal is to provide a level of service the City deserves. Right now we are treading water to provide service the community deserves. We will lose people and the cost to test and train new applicant’s is expensive. We have to express to citizens that the increase is to provide safety and security Goodland deserves. Vice-Mayor stated I do not have a problem telling people we were wrong, things change. Mayor Linin stated, moving department to Armory was to provide space needed not increase size of department. ON A MOTION by Vice-Mayor Fairbanks to increase Professional Services in Cemetery Fund $11,381, decrease General Fund Transfer to Economic Development $30,000, allowing the balance of $18,619 be allocated for project development. MOTION died for lack of Commissioner Mai stated, I respect Joni’s request but am not prepared to approve an increase in staff. Commissioner Garcia stated, last year budget discussion was centered on salaries and benefits. I am in agreement with changes made there in the budget. The three major components that will draw people to your community is good infrastructure, low taxes and low utility rates. I will not approve a tax increase. ON A MOTION by Commissioner Mai to remove the additional officer, increase Professional Services in Cemetery Fund $11,381, decrease General Fund Transfer to Economic Development $30,000, allowing the balance of $18,619 and additional monies be allocated for project development and increase by one mill. MOTION died for lack of second. Mayor Linin stated I see the virtue in ideas presented and believe with the mill system, unless the Commission wants to do something different, we do not increase the mill levy if valuations do not increase. I also feel if we do not do new things in the community you go backwards. We want the valuation to continue to increase. Commissioner Garcia stated, if we look at the changes presented in Commissioner Mai’s motion, we do not need to increase the levy one mill. Commissioner Mai stated, I believe one mill is not that much money to begin project development fund for future projects. There are many projects I would like the City to accomplish. ON A MOTION by Mayor Linin to remove the additional officer, increase Professional Services in Cemetery Fund $11,381, decrease the General Fund Transfer to Economic Development $30,000, allowing the balance be allocated for project development, keeping the mill steady seconded by Commissioner Garcia. MOTION carried on a VOTE of 5-0. ADJOURNMENT WAS HAD ON A MOTION Commissioner Garcia seconded by Commissioner Farris. Motion carried by unanimous VOTE, meeting Adjourned at 9:26 a.m.